historic former Italian embassy building, which is slated for redevelopment. not yet decided whether to convert their apartments to condominiums, or continue as rentals. If a minimum number of tenants agree to buy their renovated apartments as condominiums and they qualify, the condominium conversion will go forward, and sales will begin in late 2016. Whether the property stays rental or goes condo, UIP will Invest more than $8 million in building renovations including new individual heating and cooling systems, electrical upgrades, elevator renovations, renovated common areas, and exterior improvements including landscaping, roof deck and more. Work is expected to begin before the end of the year. Embassy Towers, built in 1932,was acquired from a private family consortium, which had held the property for decades. Along with The Century, another apartment building just one block away on 16th Street, NW, Embassy Towers is distinguished by its colorful window frames. Alan Davis and Brendan Flood of HFF represented the seller in the transaction. UIP Property Management, Inc. (www.uippm.com) has assumed property management responsibilities and UIP General Contracting, Inc. (www.uipgc.com) will perform the renovation. Both are UIP subsidiaries. 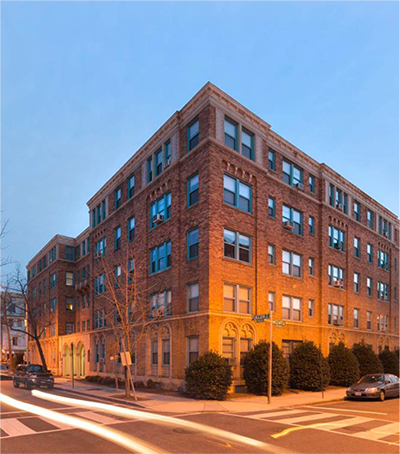 The UIP family of companies owns and manages more than 3,000 apartments in Washington, DC and Maryland and has renovated and restored more than 20 downtown apartment buildings over the last ten years. UIP’s primary focus includes working with Tenants in Washington, DC and helping them exercise their TOPA (Tenant Opportunity to Purchase Act) rights. UIP is also active in entitling land, new infill development, and acquiring residential assets in the close-in Washington, DC suburbs.For more information, visit www.uipllc.com and www.uippm.com.